In early summer, global customer experience management company SDL released its Customer Commitment Framework to help enterprises gain insights into their audience base, including how likely a consumer is to purchase, engage with content and advocate on behalf of a brand. Since then, the company expanded its social listening product by creating a dashboard that offers all of these valuable insights in one place. 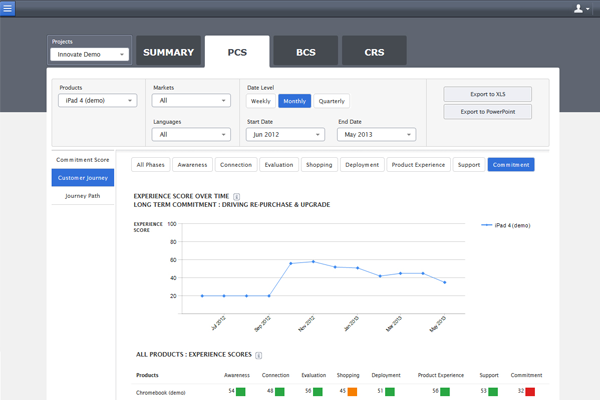 • Product Commitment Score (PCS) – This score measures buying behavior and models the path to purchase. • Brand Commitment Score (BCS) – This score measures customer advocacy and models the journey to becoming an advocate. • Customer Relevancy Score (CRS) – This score measures sharing behavior of consumers and models the path to sharing. According to Dave Clark, SDL VP of Marketing, the first part of the KPI measures a different kind of journey, and then the platform maps the experiences that make up that journey. By mapping the customer journey, enterprises can identify and remove the barriers that prevent customers from purchasing or engaging with their brand. By leveraging the Customer Commitment Dashboard, brands can better understand the path to purchase and make data-driven decisions to improve their customers' experiences. In addition to providing enterprises with KPIs that track and predict how customers will behave or respond to campaigns, SDL’s CCD offers competitive and industry benchmarking that tracks performance of a brand versus the competition through the perspective of a customer. Moreover, SDL provides real-time insights, enabling brands to make adjustments before, during or after they launch campaigns.